Move to iOS app didn’t work, and you are considering a replacement? Read this post to get 5 top best Move to iOS Alternatives that we collected in 2018. You may think that you can move everything from your Android phone to the new iPhone XS/XR or the 2019 iPad Air using Move to iOS app that you think the best app to transfer data from Android to iPhone. But after trying it out, you found this app was so complex to use or even didn’t work? 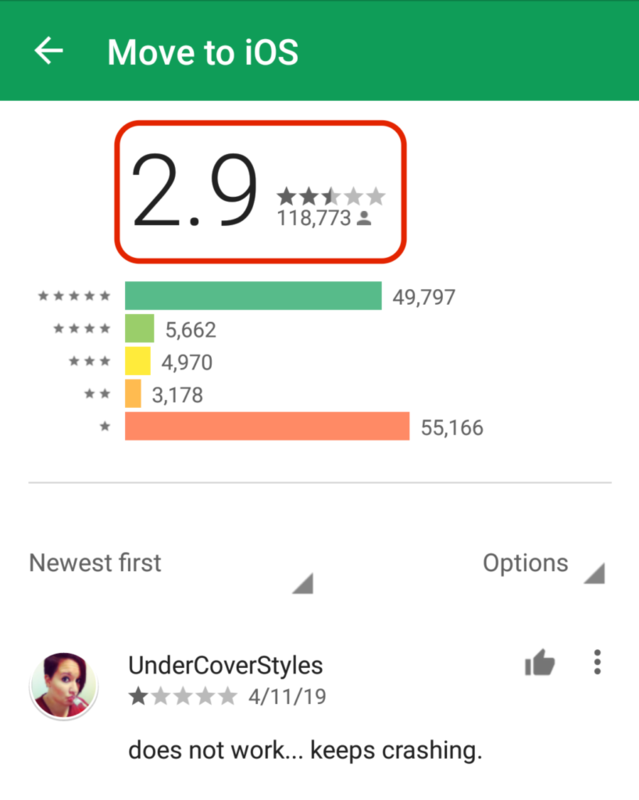 In fact, the users’ rating for Move to iOS is not so good – it got only 3 stars of average ratings on Google Play. 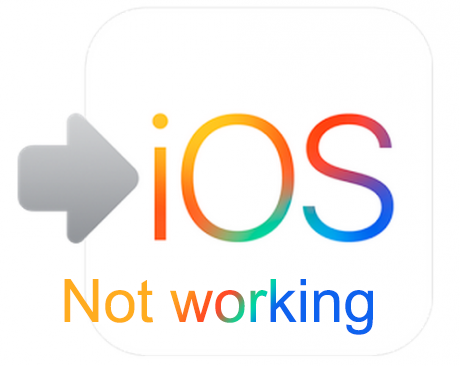 To smoothly migrate data from Android to iPhone iPad, you may need a replacement of Move to iOS app. In this post, we collected 5 professional Android to iPhone transfer tools that you can take as replacements. Now let’s take a look at these apps. There are some best apps to transfer data from Android to iPhone. I’ve been collecting this kind of apps since 2018 and I’ve recently added some new apps to this list on March 2019. And just enjoy them! Most of these apps are not free. I’ve tried my best to get free ones but found that most of the free apps don’t support 1-Click migrate data from Android iPhone to iPhone iPad. Fortunately, I got AnyTrans. 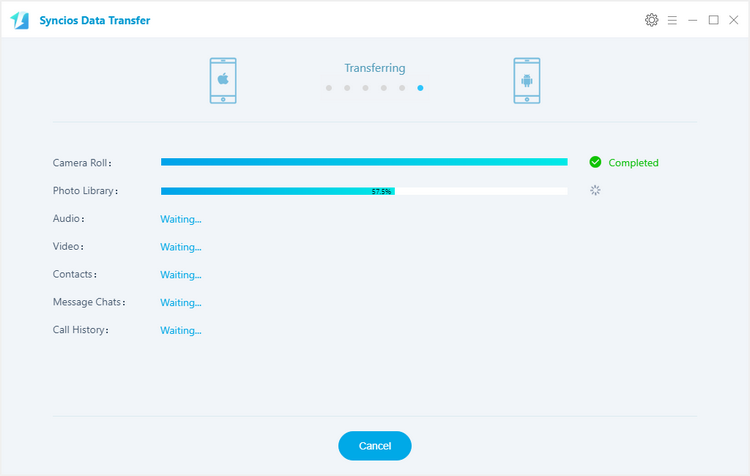 AnyTrans is one of excellent iPhone transfer apps developed by iMobie. In 2018, it added a completely free feature to help all new iOS users migrate data from their old Android devices. As one of the top Move to iOS Alternatives, this app can be better than Move to iOS since it would be more stable to transfer all or only some specific items that you want from Android to iPhone. Contacts, Photos, Music, Videos, Books, Messages, Call Logs, Ringtones, and Files. iPhone 3GS to iPhone XS, iPhone XS Max, and iPhone XR. Dr.Fone – Switch by Wondershare is one of best phone transfer apps that you should have as one alternative to Move to iOS app. Its neat and simple interface helps you easily put your important data like photos messages and contacts between Android and iOS in a few clicks. With nice device compatibility for Android models, you can take it to get things easily moved to your new iPhone from various android brands including Samsung, HTC, Google Pixel, Huawei, LG, Motorola and so on. Contacts, Calendar, Photos, Songs and Videos. This Mobile Data Transfer developed by Syncios is another data transfer app working on Windows and Mac. Similar to Dr.Fone Switch, it is also developed for phone-to-phone transferring. Compatible with a large number of Android brands, this app will be another helper for people who want to move data from Android to iPhone and iPad. Contacts, Messages, Photos, Videos, Songs, Call Log and Bookmarks. PhoneCopy by Aiseesoft is one PC-based app that you can take as one of Move to iOS alternatives to transfer contacts, photos, videos and songs from Android to iPhone. Just like AnyTrans and Dr.Fone, this app can auto convert your transferred files to be compatible with your targeted iOS device. And only by a few clicks, you can finish the transfer process. Contacts, Photos, Videos, Songs, and Ringtones. Phone Copier is one of the professional Phone To Phone Data Transfer Software that are available for people who want to transfer between two smartphones. For Android to iOS switchers, this app can move contacts, messages, calendar and media files. After installing this app on both of your phones, you can begin your transfer between them in Bluetooth. Contacts, Messages, Calendar and Media files. Last, if there is some freeway of migrating data between phones, please don’t hesitate to comment on my post to share it. This would be very helpful. If you’ve decided to switch from iPhone to Galaxy Note 9, you’ve come to the right place. We’ll break down the necessary steps you’ll need to take in order to transfer data from iPhone to the new Note 9. There are 3 free ways totally and we’ll guide you through each of them in detail. The 2018 new-released Samsung Galaxy Note 9 offers many customization options that you won’t find on an iPhone. It allows for a high level of multi-tasking, equipped with new processor and multi-window system. Not only that, but this new model could also store up to 1TB of data, should you choose to add a 512GB SD card on its integrated port? All of that sounds good, right? The Note 9 looks like one of those phones that users grow to love in a very short amount of time. Therefore, there’s a strong chance that some of you may choose to switch from iPhone to Galaxy Note 9. And to do a switch, you may like to transfer data from iPhone to Samsung Galaxy Note 9. How to Transfer Data from iPhone to Samsung Galaxy Phone? 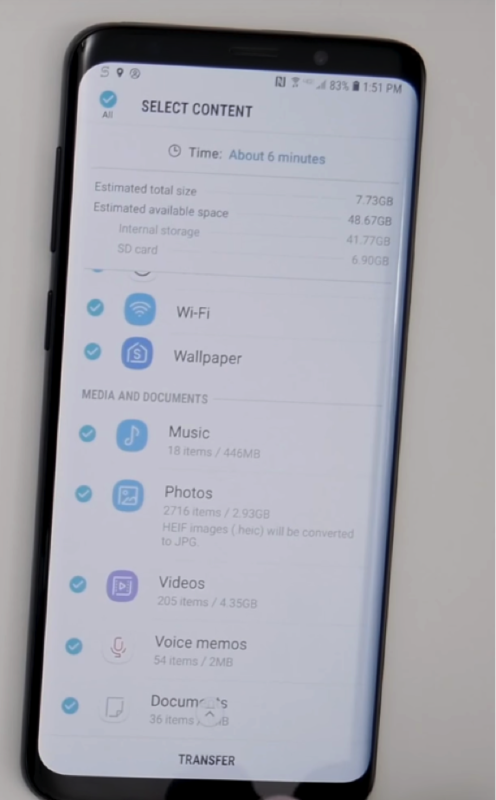 What to Do Before Transferring Data to New Note 9? It’s important that both phones are set to the largest amount of time to stay on before “going to sleep”. This helps you avoid any issues with the phones’ power-saving features. Remember that having the phone turned on for a long time drains a ton of battery, which makes it ever more important for you to have both phones fully charged before starting the transfer. Deregister/Disable iMessages on your iPhone via Settings > Messages. You’d better turn off two factors authentication on your iPhone. 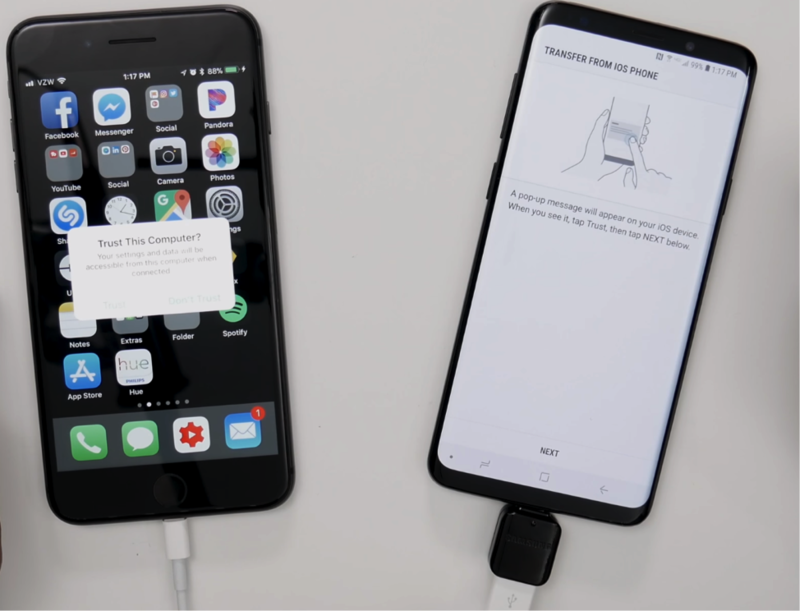 How to transfer data from iPhone to Galaxy Note 9 using USB. First things first: your Samsung phone should come with a special USB adapter, which allows it to connect directly to another phone. Keep in mind that you’ll need to use this adapter with the iPhone’s original USB cable if you want the process to work smoothly; generic USB’s used to transfer data from iPhone to Galaxy Note 9 might not work as intended (some of your data could get corrupted). Connect both phones via the iPhone’s USB cable, plugging the adapter on the other end and using it to connect to the Samsung phone. It should look a little something like this. And your Note 9 will auto run Smart Switch and go to the page of TRANSFER FROM IOS PHONE. If not, just go to Settings to run Smart Switch. Unlock your iPhone and tap to Trust This Computer. After that, click Next on your Samsung Smartphone to get information on your iPhone. And this may take some minutes, depending on how much data on your iPhone. Step 2. Select contents and start transferring data to new Samsung Galaxy phone. Once your Samsung detects everything stored on your iPhone, you can select contents such as photos and contacts, and simply press Transfer at the bottom of your Note 9’s screen, it will auto move things from iPhone to your new Note 9. This process might take up to half an hour, but it’s very straightforward and effective. Once that’s done, check your Note 9. Every shared app, your contact list, music, and basically every piece of user information should’ve successfully transferred to your new phone. Let us first warn you that transferring data using a wireless Internet connection takes a much bigger amount of time than doing it using the USB Smart Switch. This option is extremely useful nonetheless, as some iPhone owners might not have access to a proper USB cable or simply prefer doing the data transfer using a wireless method. Step 1. Create an iCloud backup with your iPhone. To start this process, all you need to do is back up iPhone data via iCloud > iCloud Backup > Backup Now. You can store up to 5GB of information for free before having to buy extra storage from Apple. Step 2. Run Smart Switch on Note 9, and then choose WIRELESS > iOS. In this case, we’re going to select the “Wireless” option. You’ll be asked which device will you transfer data from; select iOS. Step 3. Enter your iCloud’s details to access data from iCloud backup to your Samsung phone. It requires you input your iCloud email and password to login your iCloud storage. After that, you will be able to select which information stored in the iCloud you want to import to your Samsung. Once you’re done, tap “Import” and wait for the process to finish. 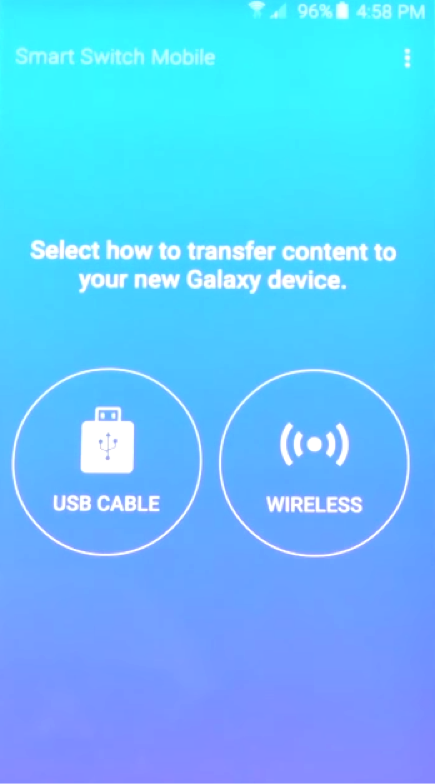 As we said, this process to transfer data from iPhone to Samsung Galaxy Note 9 is actually very simple, but it’ll take a bit more time than the regular USB Smart Switch option. 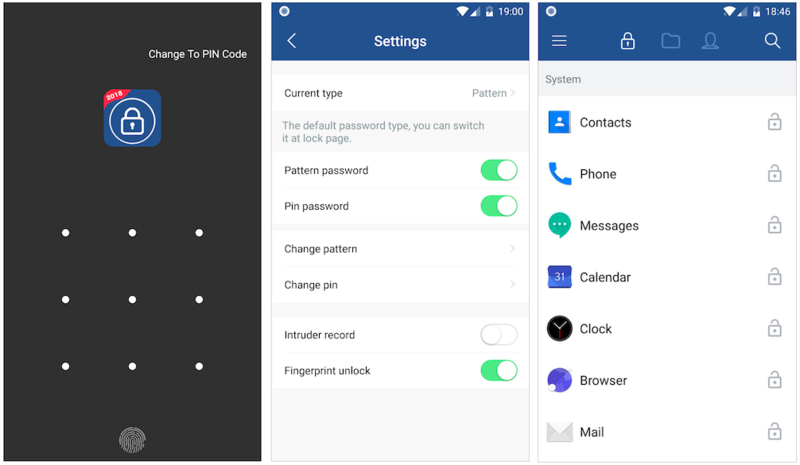 Last but not least, there are other free ways in which you can manually transfer data from an iPhone to an Android phone without needing the assistance of Smart Switch. The best way to transfer basic information, such as your contacts and your calendar, is to use Gmail’s data backup option. Simply go to your iPhone’s Gmail app and make sure it backs up everything that you need. Once you log in with your email in your new Note 9’s Gmail app, your contacts, calendar and emails should start syncing right away. When you log in to your new Samsung using your email, the contacts should be imported automatically into your Note 9. Everything else is pretty straightforward. We recommend using calendar apps to import your calendar from one phone to the other, as these are usually shareable as long as you have an account connected to them. Drive is connected to your Gmail account, so logging in to your Gmail account in your Note 9 will swiftly import your Drive files pretty quickly. You can use Google Drive to transfer any other relevant documents as well! This app is actually one of the best easy-to-use tools that you can have in order to transfer data from iPhone to Samsung Galaxy Note 9. Since we’re talking about Google Drive… WhatsApp also has an option to do a backup of all your messages using Drive’s services. Go to your iPhone’s WhatsApp settings and back up all of your conversations. When you log in to the same WhatsApp account on your new Note 9, you will be prompted to import the messages available in your Drive backup. Oh, and one last thing… If you want to upload Music to a cloud storage to then download it on your Samsung, your best bet will be using Google Play Music and selecting the option to upload them. Keep in mind that if you use Spotify or any similar app, it’s easier to simply download the app in your Note 9 and you should have access to all of your songs in an instant. Well, it looks like you’re ready to swap your iPhone for a Samsung Galaxy Note 9. As you can see, none of the processes are extremely complicated, but we do recommend using the Smart Switch USB method to relocate your iPhone’s data to your new Note 9. This will guarantee a quick and effective data transfer. The methods we listed in this article are the main options you have when it comes to transferring data. Keep in mind that other methods also exist (like using backup apps found in both the PlayStore and the AppStore), but the ones we showed here are proven to be the most effective and error-free. Have you been thinking of getting a cloud storage service for the pictures you take with your smartphone? Well, here’s some valuable insight into Android cloud apps that will help you choose the best solution for your needs. Android users are gradually embracing cloud storage as a reasonable alternative to SD cards, which have long been the first choice for mobile phone storage expansion. In addition to the extra space, the Cloud gives you the chance to store photos in a location that is separate from your vulnerable smartphone. Proper cloud services will also enable you to access your media files from all your smart devices. And, unlike in SD modules, where the need for more storage can only be fulfilled by buying a new card, you can expand your cloud easily by upgrading your subscription. So, if you take a lot of photos with your smartphone, cloud storage that syncs automatically will keep all your pictures secure and accessible. Android has a host of paid and free cloud services that can be excellent for storing photos. All you have to do is know how to choose the one that will serve you best. Getting a great cloud storage solution for photos can be a challenge but knowing what to look for will make it much easier to sort through the pile. Although free services with unlimited storage exist, most utilities offer customers some space for free, after which payment is needed to upgrade your quota. Ideally, you’ll want to look for a cloud solution that provides a fair amount of storage for the price. In addition to space, it is also important to consider the level of functionality that the cloud service app offers. For instance, if you already have thousands of photos on your phone and would like to upload them to your new space in the cloud, you wouldn’t want an app that will force you to open the folder and select all the pictures in it one by one to upload them. Most services will accept common image formats like JPEG, PNG, and GIF, but if you’re planning to store less mainstream types like RAW or TIFF files, you’ll need a solution that offers enough flexibility. Whether you’re looking to save sensitive pictures about an upcoming product launch or just your every-day selfies, comprehensive security features are a must-have on your checklist. Although today’s increasingly sophisticated crop of cybercriminals makes it next to impossible to guarantee security on any digital storage utility, a feature like two-factor authentication or zero-knowledge encryption can significantly minimize the chances of an attack. Finding a solution that meets all your requirements will be tricky, more so if you’re not willing to reach into your wallet. Nevertheless, the Android cloud market has more than a few free apps that, despite some notable downsides, could be excellent choices. Arguably the best free cloud storage service for photos, Google Photos offers free, unlimited space for images whose resolution is 16 megapixels and below, and 15GB of space via Google Drive for higher-resolution pictures. The intuitive app allows you to set auto back-up to keep your media files accessible from any device, and you can also search for anything you store by typing the name of the person, place or thing that appear on the photo. The best thing about Flickr, besides the 1000GB of free space, is that it is designed for presenting your photos rather than merely storing them. Its interface displays your content in an enjoyable, attractive and interactive photo stream, which other users can follow and comment on your shots. Because Flickr displays pictures, however, you will only be able to upload JPEG, PNG and GIF files. Unlike Flickr, OneDrive isn’t designed solely for photographers. Nonetheless, what it lacks in the interface, it makes up in functionality. In addition to being straightforward to navigate, the app will integrate seamlessly with the office utilities you have on your phone or laptop, as well as other Microsoft applications, such as Arrow Launcher for Android. You can choose to upload your photos and videos automatically using Camera backup or manually, and it also works with Android Wear, in case you would like to be flicking through pictures from your wrist. OneDrive offers 5GB storage for free, beyond which you’ll need to pay some cash. Google Photos, Flickr, and Microsoft OneDrive may be the top three best free cloud backup solutions for photos on the Android platform, but other reasonable options exist if you’re itching for something different. For instance, while the 5GB that Sync.com’s free plan offers is nothing remarkable, the service gives you the chance to earn an extra 1GB of additional storage for every friend you refer, with no cap on the number of referrals you can make. Amazon Prime Photos, on the other hand, provides free unlimited photo storage to Amazon Prime Subscribers, and also comes with some useful features for sharing pictures, including a folder called “Family Vault” that lets you create photo albums with family and friends. Despite its relatively limited 2GB of free capacity, Dropbox is a favorite among professional Android users, thanks to its fast, intuitive and glitch-free app, as well as its wide range of business-focused tools, which make it easy to share pictures and collaborate. Box, another business-centric cloud storage app offers most of Dropbox features along with a more generous 10GB of free space. Cloud storage, even a free subscription, can be exceedingly beneficial. It’s efficient, frees up your phone’s internal storage, and it’s far more reliable than a microSD card. If you don’t have a backup service for your photos, now is as good a time as any to get one.